Shopping doesn’t have to be a daunting task. If you need a gift for a tween girl, then check out our list of cool things tweens will love. We have picked out some really fun things, in all price ranges. From brand new crafts to try to things they can explore, there is something for every pre-teen on your list. With the HP Sprocket Photo Printer, your tween girl can conveniently print photos from her smartphone or tablet—and from virtually anywhere. Make time with friends more memorable with instantly shareable 2 x 3-inch snapshots or stickers of every fun-filled moment. Pocket-size printer: About the size of a smartphone, this Bluetooth printer goes anywhere. It easily fits into a bag or backpack, and it’s so light you’ll barely notice it’s there. The rechargeable battery prints up to 30 sheets of photo paper per charge, and recharges in just 60 to 80 minutes. Prints with personality: She can show off her creativity with filters, frames, stickers, text, emojis, and more. The HP Sprocket App lets you customize your photos before you print them. Calling all Pusheen fans! This “grown-up” Pusheen coloring book is a great activity to keep those tween girls busy. The Internet’s favorite chubby, tubby tabby is back in a purr-fectly cute coloring book featuring adorable kitty drawings that will charm cat lovers and coloring book fans everywhere! This book contains 94 coloring pages. It pairs perfectly with a set of nice pencils. Even tweens love having their own secret hideaway! This pretty bed tent is a great place for your tween to read, study and more. There are three doors for your tween to easily access her tent and it has a great venting system so that air flows through the tent. This tent is twin sized and comes in three, pretty, muted colors. Your tweens will love learning about the exciting hobby of rock tumbling with National Geographic. This set includes all the accessories you’ll need to start polishing dazzling gems. Rock tumbling is tons of fun and a great way to start an extraordinary rock collection. Rock tumbling is a fun activity for children of all ages and promotes an interest in geology and science. Introduce your kid to science the fun way! Join National Geographic as we inspire future generations by showing them the wonders of the natural world. This high-quality tumbling machine has powerful motor that will last for years and comes with a 2-year warranty. It includes an automatic shutoff timer, a noise-reducing, leak-proof barrel and easy-to-follow rock tumbling instructions. Seeing their favorite Harry Potter books come to life is so much fun! These Harry Potter Illustrated books gives them amazing illustrated pages as they read along. My kids love these! So far, they have only released three books in the series as illustrated books. They are truly collector’s books. Your Harry Potter lovers will love these gorgeous books! Brought to life by Kickstarter, the Dribble Up Smart Soccer Ball is the ultimate gift for soccer players of all ages. The smart ball is designed to measure your movements in real time. Just download the app and use the included tripod and ball for your soccer workout. The heavy duty ball feels like kicking a normal ball, not a bundle of batteries. Virtual trainers guide them to the next level with specific, interactive feedback. Your tween’s performance is graded on speed, control, consistency and pattern. This way they will be able to see exactly where you need to improve. You can get this soccer ball in both size 4 and size 5. Finger Knitting Fun is a fun project for tween girls! Learning how to knit with your fingers is the best way to start crafting without cumbersome needles! All you need is some yarn and your hands to create modern and sophisticated knitted strands that you can use in any project around the house or everyday fashion. From jewelry and wearable accessories to wall art, gifts, and room decorations, Finger Knitting Fun includes illustrated, step-by-step instructions for 28 projects, which use yarn and other exciting materials such as paracord, leather, and more. She can grab that ball of yarn and easily turn it into a charming knitted piece with endless possibilities! Let your tween’s imagination run wild with this cool Makey Makey Invention Kit. They can Make a banana piano, play games on a play dough game pad, take a selfie of their cat every time she drinks water. How? First, load up a computer program or any webpage. Let’s say you load up a piano. Then, instead of using the computer keyboard buttons to play the piano, you can hook the Makey Makey to something fun, like bananas, and the bananas become your piano keys. There are so many fun projects they can try at the Makey Makey website. Older tweens will love transforming a simple sheet of paper into a runway-ready outfit with easy-to-follow instructions and illustrated diagrams from origami master Sok Song. With thirty unique origami models and fashion-forward folding papers, she’ll create one-of-a-kind gowns and sophisticated dresses for elegant occasions, as well as everyday items such as jeans, sweaters, and jackets-plus accessories to complete every look. Everything that is needed to create a custom origami wardrobe is included. Origami Chic is a fun project for older tween girls. Kick up your child’s cool factor with the heavy duty, but lightweight and foldable Swagtron K1 Foldable Scooter for teens and kids. This non-motored cruising scooter can adjust and grow with your tween. As the perfect riding companion for ages 7 to 15, the kick scooter will accommodate kids and teens of nearly any height! It features a height adjustable stem and high-grade aluminum alloy frame that easily carries up to 220 lbs. With the kick scooter kids, each kick down the street will feel comfortable and smooth. The 20” deck is fully covered with grip tape while the handles feature non-slip sleeves. Your tween need only plant their feet and hold on to begin riding without fear of falling off. The fully rotating stem can steer out of obstacles and built-in brakes provide instant stops. There is even a quick lock to help prevent the 2 wheel scooter from accidentally folding. Tweens, teens and adults love this unique Gubs game. Welcome to the enchanted world of the Gubs! Brothers Cole and Alex Medeiros crafted this unique card game that perfectly captures the essence of our company motto: “Games for the Infinitely Imaginative”. From the richly detailed illustrations, to the whimsical array of cards, to the simple but compelling game play, Cole and Alex came up with a game that has all the trappings of a Gamewright classic. We’re proud to shed light into the Gubs wildly fantastic world and introduce them to a whole new audience! The LittleBits Rule Your Room Kit comes with instructions and parts for 8 inventions such as a Burglar Buzzer, Domain Defender, Top Secret Safe and inspiration for thousands more! Your tween boys will love developing engineering and problem-solving skills by creating interactive inventions. Little Bits has lots of other great kits like the Smart Home Kit, Coding Kit, Giszmos and Gadgets Kit and More. Tween artists will love this introduction to hand lettering! Taught by the popular and skilled hand-lettering artist Dawn Nicole Warnaar, Adventures in Lettering combines creative self-expression and beautiful designs for an exploration of various lettering exercises. This hand-lettering workbook features hand-lettering lessons for beginners, from playing with style and brush calligraphy basics to illustrated hand-lettered designs and lettering styles. Once you’ve mastered the basic techniques, apply them to additional crafts and projects. Pair this great book with these Brush & Line Double Ended Markers. Each brush and line marker has a brush tip on one side and a fine point on the other making this marker set a fantastic choice for the serious adult coloring artist. Color in the most detailed coloring illustrations with the 0.7mm fine tip. You’ll find the brush tip is a fantastic tool for creating spectacular coloring textures that will make your coloring projects stand out among the rest. Watch Ya’ Mouth is the AUTHENTIC, Hilarious, Mouthguard Party Game and your tweens will get a kick out of this game. In this laughter-inducing, competitive card-based game, teams of players, hampered by cheek retractors, attempt to read and interpret/speak out phrases and…. Hilarity ensues! Good for Ages 8+, with virtually unlimited players (when played using our “Alternate” rule set), Watch Ya’ Mouth is a must for any gathering, party, game night, or family night. Our mouthpieces are FDA and CE certified, our cards are thick and durable, and our community is second to none. Your tween can practice her soccer without the help of others with the Soccerwave Jr. She can practice different soccer techniques like trapping, heading, volleying, ground ball and pass accuracy with this cool soccer training tool. The most unique part of the Soccerwave Jr. is its graduated varying curvature at the top edge of the front (curved) net. This unique feature causes the ball to be returned in different trajectories and forces the player to adjust his or her position to deal with theses unpredictable returns. The Soccerwave Jr. separates into two parts for ease of transport. These cute crew dog socks are a great gift idea for tween girls. They are practical, cute and affordable. This set of socks includes 4 different fun pairs of socks. Your tweens will love these cool snap-in cruiser Cardiff Skates by Cardiff Skate Company . My daughter has a pair and she absolutely loves them. These are not inline skates… Not roller skates… They’re Cardiff Skates. They are recreational skates that are built to be smooth, quiet and quick-like inline skates which are stable and easy to stop and stand. Most tennis shoes snap right in to the skates. There are youth sizes or adult sizes and each type of skate fits a variety of sizes. Older tweens will love this grown up Washi Tape Crafts Book. It is packed full of amazing projects and ideas, this book has everything you need to transform everyday items with washi tape. It includes 10 super adorable rolls of washi tape to get your tweens started! This book will grown with them as some of the projects are easier and some are more complicated. 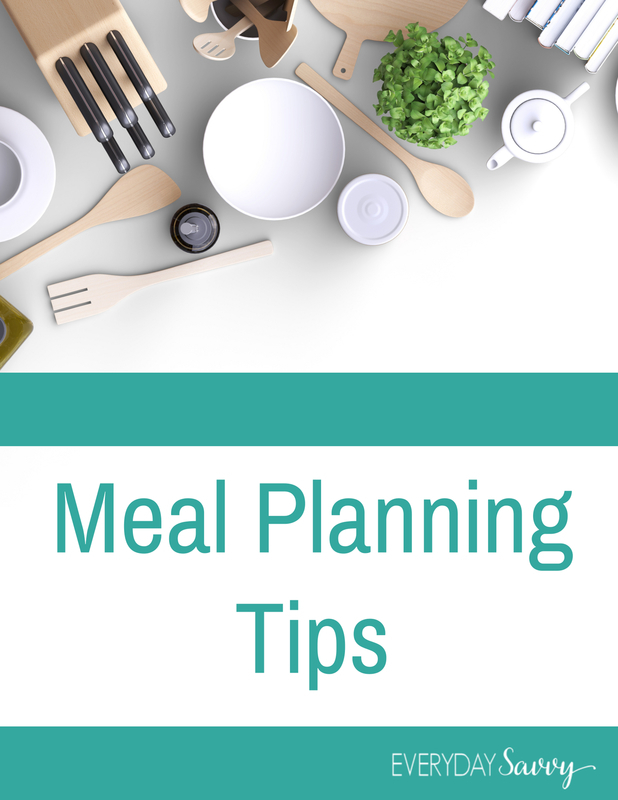 It includes techniques like precision cutting, wrapping, and weaving; making bows, rosettes, and other shapes; writing on washi tape—and stamping on it, too! Plus, how to weather-proof designs to make them permanent. My daughter bought the Creatibles DIY Erasers kit with her own money and she had so much fun making these. I was shocked at how well the kit worked. The easy make and bake eraser kit where you can shape your very own eraser. You build it, bake it and erase with it. Make all sorts of amazing eraser creations with this Do It Yourself kit. Creatibles comes with 12 pliable clay colors that can be mixed for an endless amount of hues. Create any kind of cool shapes, characters or whatever you want your eraser to be. Follow the baking instructions and you’ll have an amazing eraser all your own. And it comes in a nifty reusable case. It’s fun to make and fun to erase. I adore this super cool Fujifilm Instax Mini 9 Instant Film Camera and it makes a great gift. Think of this camera as a modern day polaroid camera. How fun it is to take a picture and instant photos pop out. You will love the features of this camera, plus it has a light, slim body and comes fun colors like pink, blue, yellow, white and black. You will also love these fun accessories for your Instax Mini 9 camera that you can gift, along with the camera itself. You tweens will go crazy over these larger than life iScream Pillows . There’s always room for one more fun, bright, comfy, crazy pillow – especially when it’s as fun as this yummy treat of a pillow! This full-color, soft poly/spandex blend pillow features a photoreal print on both sides and is super comfortable and squishy since it’s filled with microbeads that move with you. The perfect combination of fun, design and comfort! They come in all sorts of fun prints like donuts, cakes, a gumball machine, popcorn, a cookie and more. This Ravensburger Mickey and Minnie: Eiffel Tower – 3D Puzzle is just adorable and so much fun to put together. Your tween will love constructing a famous landmark with this new Easy Click Technology in interlocking puzzle pieces. With uniquely curved, hinged and flat pieces, you can create stunning 3D replicas of well-known structures around the world. It’s different to any other 3D puzzling experience. Sturdy when completed, easy-clean surface, no delaminating, no peeling and best of all – no glue required. Your older tweens will have so much fun piecing this together. HUE Animation Studio complete stop motion animation kit contains everything that you need to create your own stop motion animation videos. For use at home or for school projects, it’s a creative and educational pastime that can be enjoyed by the whole family. This perfect gift for kids encourages creativity and imagination. Whether you’re making a LEGO brickfilm with lasers and explosions; filming a claymation movie or watching a flower bloom using Time-lapse photography, you can bring anything to life in minutes with the easy-to-use software. Tweens that love to spa will love this fun Conair Foot Spa and PUEEN 3D Nail Art Sticker Collection Set . A luxurious spa experience awaits your tween with Conair’s relaxing foot bath. Step into the vibrating, soothing foot spa. Easy toe-touch control allows you to activate all the features. Afterwards, they can paint their toes and finish with a cute decal to give your tween that fresh from the salon look. I have bought many Klutz craft kits for my daughter and I have never been disappointed The Klutz Grow Your Own Crystal Jewelry and Klutz Mini Pom Pom Pets are from their newest collection and your tweens will love doing these projects. All of the supplies needed along with the instruction book are included and these kits are perfect for raining or snowy days. 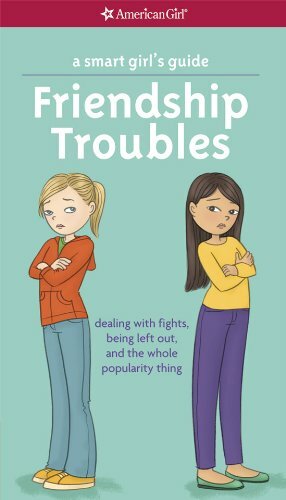 What tween girl hasn’t had friendship troubles and this newly-revised book by American Girl helps to navigate through friendship issues. This book discusses backstabbing, triangles and other tough friendship problems. While this may seem like a very practical gift, American Girl seems to somehow make light of difficult situations. Animal lovers will adore this cute Lego Friends Heartlake Puppy Daycare set. All the dogs of Heart lake City love coming to play at Andrea and Mia’s Puppy Daycare. Run around the agility course with them in the garden-it’s like a playground for pups! Head inside to give Luna the Husky and Toffee the Pug a good wash in the bath and a pamper session. Then they can have some food and rest on their special beds while you take a new booking on the computer. 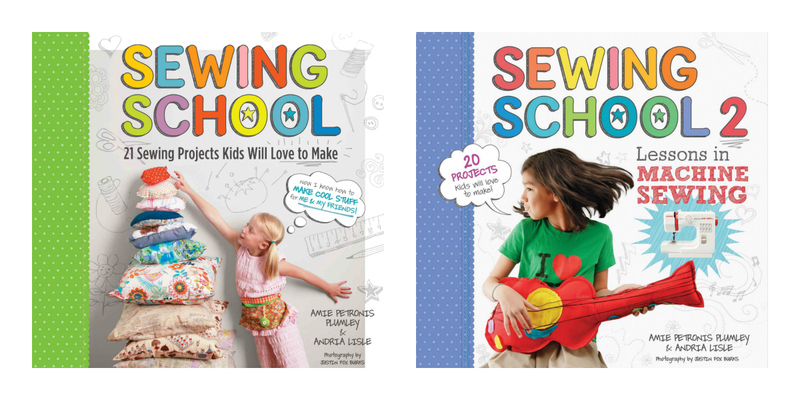 I love that there is a super simple book for tweens to learn a little bit about sewing. This book includes lots of easy, hand-sewing projects for your girls to try, even if your family is not a sewing family. This book boasts that very little parent supervision is needed, which is great because most tweens are so independent. Sewing School: 21 Sewing Projects Kids Will Love to Make includes patterns and instructions for 21 projects such as a doll blanket, pillow, drawstring bag and more. Once hand-sewing is mastered, your girls can try Sewing School 2: Lessons in Machine Sewing; 20 Projects Kids Will Love to Make , which is a beginning machine sewing book. This highly-reviewed book includes 20 different machine sewing projects. Your tweens will love having their own Nerf Rebelle Star Shot Targeting Set, just like their brothers. They can compete with friends and test their skills in a bow-blasting competition with the Star Shot targeting set! Just Load up the crossbow blaster with the suction darts and pinpoint your mark with the targeting light. When you’ve lined up your precision shot, pull the trigger to fire! With two different dart colors – one for you, one for your opponent – it’s easy to see who had the best skills with each crossbow shot. 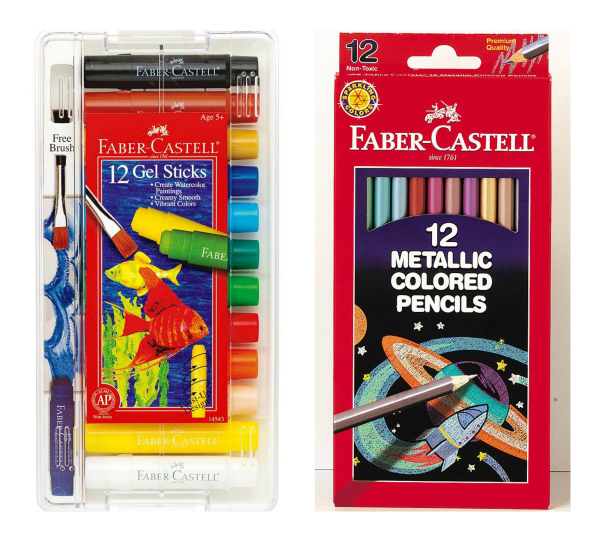 These Faber Castel art supplies aren’t your average Crayola products. 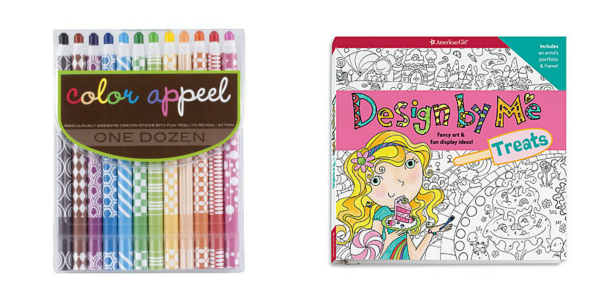 They are cool, innovative supplies for your budding tween artist. I love these Eco Pencils 12 Metallic Colored Pencils . These are high quality and will add pretty metallic colors to all of their projects. If you have never seen Gel Sticks before, these ones are geared towards young artists. They are semi-solid paint sticks that roll up and down. You can rub them straight onto our project or you can dab a bit of water on a brush and use the gel stick that way. Design by Me: Treats is an older girl book for coloring projects. American Girl has a few of these, but the one above is newly-released this year. My daughter has one of the Design by Me books at home and she has enjoyed every project. There are fun fold-out posters, metallic and flocked pages and more. We also love these Metallic Appeel Peelable Crayons . They are similar to crayons, but you peel away the paper to sharpen them. They are long like a pencil or pen and have really lasted in our house! If you love this list of great Gifts ideas for tween girls and you need more gift ideas, then check out our Ultimate gift ideas page. We will be adding more gift ideas and holiday shopping tips all month. Be sure to sign up for our free newsletter so all the updates comes right your inbox. These are all great ideas for a tween girl. Some of them look somuch fun that I wish I was a tween girl again to be able to enjoy them. Or maybe it doesn’t matter… I can still doodle with the pretty pencils.